I am not always too keen to review celeb cookbooks. Any that grace these pages will be there because I think these people are in some way a cut above the average TV chef. Yes, I do enjoy Jamie Oliver. I have been fighting shy of reviewing anything by Jamie Oliver just because he is so celebrated. He doesn’t need the publicity and I don’t need another book… so why bother? It’s simply that I like his food. I remember him when he was young(er) and Naked presenting food which was exactly what I wanted to eat. His infectious good humour made cooking accessible to a new generation (OK, that doesn’t include me) and helped to make food trendy. Anyone who encourages a nice bit of cooking and good food has got my attention. I have watched Jamie Oliver at Home on TV and it’s evident that this lad does love his food. Yes, he is a chef but also a man who eats, and wants to provide the best for family and friends. The best doesn’t need to be complicated and fussy food with a raft of posh ingredients. We are talking simple and fresh with a dash of imagination. 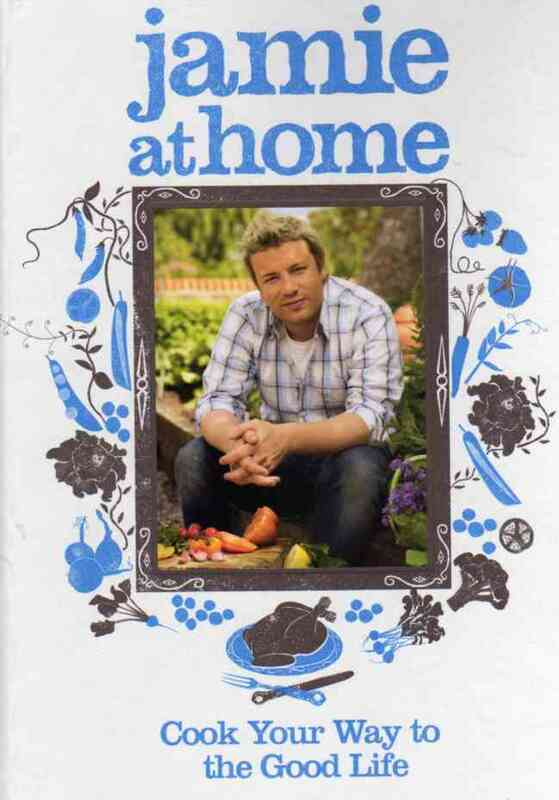 Jamie at Home is a book about a cook and his cooker, and a guy with a garden. Don’t be put off if you only have a window-box on the 6th floor. The important element is seasonal freshness, so if you can’t grow your own, buy from your nearest market. This book is divided by season and then by ingredient. For example Spring has asparagus, eggs and rhubarb; Autumn sees chillies and peppers, game – both feathered and furry, mushrooms, orchard fruit and pickles. There is plenty of advice on growing produce and suggestions for varieties of vegetables. The photography by David Loftus is striking and helps to make this volume a charming ramble through the gardening year. The food has that Oliver touch of simplicity. It’s the sort of cooking that represents the way we eat today… or should eat. It has that wholesome feel but without being off-putting to those who have no interest in “Green” “Organic” “Earth-saving” “Yoghurt and sandals”. It’s sensible and tasty grub and not at all cheffy. Jamie has a delightful recipe for Crispy Asparagus Soldiers with Soft-boiled Eggs which is a combination of comfort and joy. Eggs and soldiers (traditionally the “soldiers” are fingers of bread or toast – nothing to do with the military so you can quite happily offer this to pacifists) were always a favourite supper or breakfast for kids. The asparagus wrapped with thinly sliced pancetta or smoky bacon elevates this dish to swanky adult fare. Potato Salad with Smoked Salmon and Horseradish Crème Fraiche looks lovely and would make a great summer lunch or starter for a smart evening meal. It’s simple to prepare and relies on the marriage of well-chosen ingredients to give impact. What could be more traditional than Blackberry and Apple Pie! It’s my preferred fruit dessert and I didn’t think it could be improved upon. Jamie makes a delicious addition to the usual ingredients in the shape of stem ginger. This provides just a hint of warming spice without masking the flavour of the blackberries. If you are not a lover of pastry then make the pie filling and serve with vanilla ice cream or crème fraiche for a light and summery dessert. Bubble and Squeak with Sausages and Onion Gravy is my pick of this book. It’s traditional British fare and originally made on Monday with Sunday’s leftovers. Jamie cooks the winter vegetables from scratch and serves with venison or beef sausages. The bubble and squeak (the name refers to the sound of frying veggies) is also delicious served with fried eggs. Jamie at Home – Cook Your Way to the Good Life will be well received by Jamie Oliver’s legion of fans, and also appreciated by those who want to grow and eat their own produce, and those who just enjoy simple, appetising food.